Let’s Talk Piracy—Make Your Opinion Known! 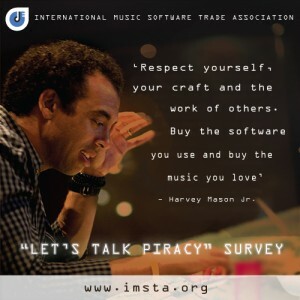 As you may know, every year IMSTA conducts the “Let’s Talk Piracy” Survey in order to obtain a better understanding of the motivators behind software piracy. We then analyze the data and provide our findings, along with any observed trends to our members. It would be much appreciated if you could send this to your marketing, web, and social media teams and to ask them to promote the survey as much as possible. With your help, we could receive plenty of responses and have the results analyzed and prepared for our meeting at NAMM. As software is of incalculable importance not just to PreSonus, but also our entire industry, Please click here to take the survey. It won’t take but a minute. Also, feel welcome and encouraged to share your thoughts on software piracy in the comments section below. That will take as little or as much time as you like.